Oh hey - a recipe of sorts. Consider this a super simple beat the heat kind of beverage. I peeped in the fridge the other night and noticed I had most of a bottle of sweet and sour mixer. So, I rummaged around and found an unopened bottle of club soda. It's rather like a virgin Tom Collins and would be super tasty with a little gin or vodka in it. However, I was simply looking for something simple, cool, and non-caffeinated. Plus, it used up some leftovers in the fridge. You can adjust the amounts of mixer and soda to your taste making it as sweet or not sweet as you like. It tasted quite a bit like a heavily syruped sprite. How to ruin a diet in under 30 minutes. More fiddling with pictures. On this one I didn't use the flash and let pshop auto correct the levels. The color is a wee bit off - vanilla ice cream isn't quite that yellowy and the rim on the plate is green. Note on that - those pyrex plates are ones that I've been eating off of for my entire life. My pop rescued them from Nana's garbage can when he and mum were first married. Yes, he's always been "frugal". Bananas foster cake was a raging success. Much much much tastier than the derby cake and didn't leave me feeling nauseated. Derby cake is going to need quite a bit more experimentation before I'm ready to serve it at a function. So, I started with the rum cake that I made last night (single 9 inch round). Then I made bananas foster and poured them over the top. I gave it a few minutes to soak into the cake, then served it up with a scoop of ice cream. Y'know, I had a recipe for bananas foster once, but I haven't seen it for ages. It's become one of those things that I just go all native on now. Rather like when you ask your grandma how to make biscuits (unless it was my nana, whose biscuit recipe began with "get the pillsbury can out of the fridge and whack it against the counter"). I've even found that I can wing it in a pinch. Tonight I tossed half a stick of butter (yes, real butter) in a skillet with maybe 3/4 cup of brown sugar. Fired up the heat to raging and let it come to a simmer. Then I sliced up 3 super overripe bananas into the mix and let them cook a bit, dropping the heat. The point is to get the bananas nice and done and banana flavor all through the sugar mixture. When the bananas are falling apart, it's done. Then I added a sploosh of vanilla extract and let that cook in. Followed that with a small sploosh of meyer's rum. For real bananas foster, you are supposed to flambe them. However, I honestly could not tell you when was the last time our stove hood was degreased and I have no desire to set the kitchen on fire. So, I don't. I should also tell you that, for safety's sake, you should remove the pan from the heat before adding the rum. I never have and it hasn't burst into flames yet. Remind me of that dumbass behavior when I burn my eyebrows off. 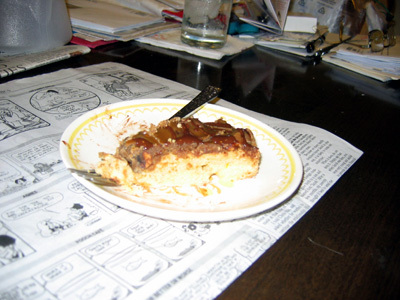 So, once the alcohol had cooked off of the rum, I spooned the whole mixture over the rum cake. Holy Jesus H. Christ on a pink polka dotted mini-bike! (I read that in someone's comments recently and it made me giggle, I love the imagery) A wee bit of ice cream on the side and it was absolute cake perfection. I will have a tough time protecting a piece of it from dad long enough for Sparks to get here. All in all, a definite keeper. I think it might be even better than just plain old bananas foster with ice cream. I don't have the patience for lovely staging of food photos for my blog. I tend to just snap a quick shop before digging in. The flash always winds up washing everything out until it all looks white. Believe me, though, when I tell you that this cake tastes amazing and actually looks fairly pretty. A few weeks ago, I heard something on TV about "Derby Cake". I've heard of Derby Pie (chocolate chip pecan pie) but never Derby Cake. So, I went to my old pal Google for the answer. Derby Cake was just created last year by Mert's Cakes in Louisville to be the official cake of the Kentucky Derby. It's described as "an amazing fusion of moist butter praline cake, dark chocolate and fine Kentucky bourbon." As we all know, I prefer attempting these things myself as opposed to just purchasing them. Especially when the price is $40. For a cake? Is it going to do tricks for me? Clean the house? I was thinking of making this cake for my derby party on saturday, but I wanted to do a test run first. I hate to serve something without ever having tasted it. 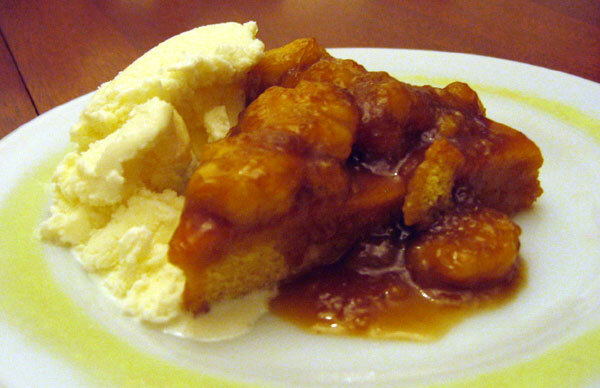 I've also been thinking of experimenting with a bananas foster cake. A test cake doesn't have to be a full sized cake, it can be just one layer. The flavor is all I really want anyway. So, I started with a boxed cake mix since I was feeling kind of lazy about it. Just your standard run of the mill Duncan Hines yellow cake mix. I mixed it up per the package directions except that I left out 1/4 of the water. Then I split the batter into two bowls. To the first bowl, I added enough dark rum to make up for the lessened water. Stirred it all up and baked it according to the directions. This will be my bananas foster cake, but for tonight was set aside after baking. To the second bowl, I added enough bourbon to make up for the reduced water. Mixed and baked. Once it cooled, I evened it up and put it on a platter. I toasted some pecan halves while starting the frosting, then placed the halves on the top of the cake, trying to spread them out evenly. For the frosting, I put 1 cup of brown sugar, 2 tbsp salted butter, and 1/4 cup of milk in a pan and cooked it over fairly high heat until it started boiling. Then I reduced the heat and let it come up to 236 degrees (soft ball stage). I removed it from the heat, added a bit of vanilla and stirred until it started to thicken. I spread/poured this over the single layer of cake and pecans. Then, I melted some dark chocolate and drizzled it around on top. The bourbon taste, which seemed very minimal in the bite of just cake that I tasted (from evening it off) seemed to step up quite a bit with the addition of the frosting. Don't let dad bully me into using the cheapass bourbon again. I'm 90% sure a better bourbon would make for a better cake. Maybe try cooking the frosting slightly less next time so that it doesn't get as hard when it cools. Of course, it was the consistency of a praline and that's what I was after, so maybe not. The cake didn't rise very well, maybe due to the fact that we've had those cake mixes for probably 5 years. Pop likes to catch things on sale and stock up to a stupid level. Buy a fresh mix for next time or make a cake from scratch. Watch the pecans closer so that they don't burn when toasting! But they didn't burn so badly that they tasted burned, so I used them anyway.